"Writing may send warm shivers of pleasure up your spine. Or it may make you feel as though you are drowining in an angry, choppy, icy sea with nothing in sight but hungry, toothy sharks and storm clouds spitting out hail stones as big as golf balls." This is the first paragraph of a wonderful new Creative Writing course by Indiana author Sharon Watson. 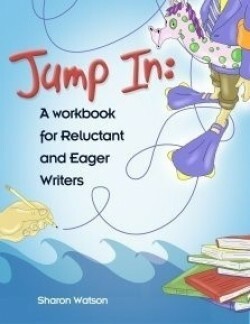 Intended as a course for middle school students, "Jump In" can also be used by high school students who have had little practice in writing or who are reluctant writers. Students will learn how to write opinions, persuasive papers, many types of expository papers, descriptions, narration, and poetry. Though the text is accessible, it is not dumbed down, but rather is crammed full of useful information. The instructor/parent section includes what to look for in an assignment, how to give a grade, how to help the student proofread, and a one-year writing program called "10-Minute Writing Plunges." These are daily writing prompts designed for fun and interest.